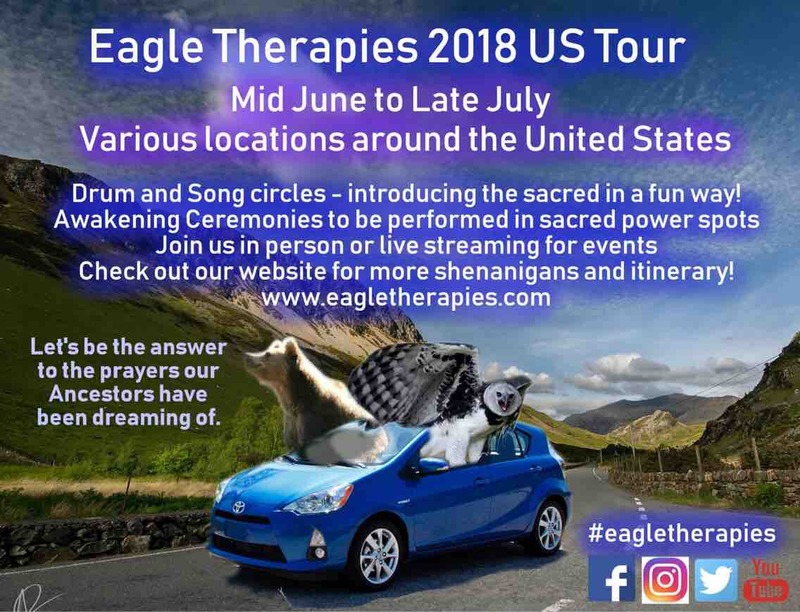 So... Who is Eagle Therapies ? Eagle Therapies is a small business started by Stephanie Seger in 2014. It was an authentic approach to me establishing myself on my Shamanic path. I have studied with Mary Tyrtle Rooker , Christina Pratt, and have taken courses with/read books by Michael Harner, Evelyn Rysdyk, Sandra Ingerman, and Betsy Bergstrom. 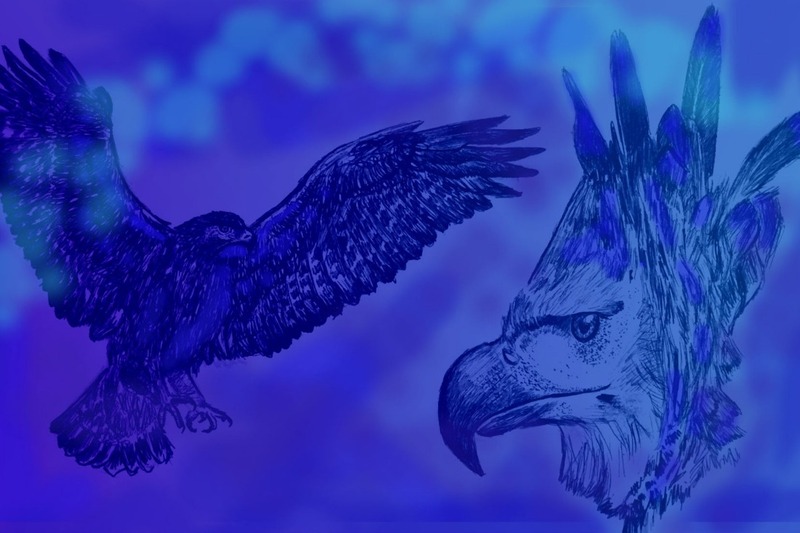 Since the first Shamanic Journey group back in early spring of 2014, Eagle Therapies has hosted a number of different events in the Northern Virginia, DC, and Maryland area. This is the main local nest, and it has grown to a robust 8-12 events a month, centered around getting people connected with their mental, emotional, and spiritual bodies in a healthy way. Most of the time it's through fun activities like dancing, drumming, or singing (there's at least a little each event). Some big lessons for me at this time include trust (trust in myself, trust in the Universe, trust in my guides), humility, asking for help, and faith. Honestly? I tend to be pretty hard headed, so what's going to push me out of my comfort zone the most? Get in front of a bunch of strangers across the US with community that I have not been tending carefully over the past 4 years... No. It's not terrifying at all. One of the things about being a Shamanic Practitioner, is that you have to live in good relationship with the world around you. Through a Shamanic lens, you understand that everything has a Spirit, and we are all connected and interconnected to the Spirit in all things. At first I thought this was going to be a small road trip, but I was wrong. Initially, I journeyed to the Land Spirits requesting permission to travel safely across them. They brought me to the spirit of Great Grandmother Turtle of Turtle Island. She had a mission for me if I chose to accept it (cue Mission Impossible theme). The main reason why I was given this seed of doing a road trip last year was to offer Ceremonies similar to those I hold in the DC area across the United States. Grandmother Turtle has assured me that the time is right for me to perform what she calls “Awakening” Ceremonies. This is a "Guided by Spirit" road trip, and I'm going to be as transparent as possible with this trip, making my life on the road public for all who are willing to view. Follow us on Facebook, Twitter, Instagram and sign up for the special road trip newsletter (it will be sent out once weekly and good for those who stay away from social media). The purpose of taking these ceremonies on the road is to bridge these gaps of learning to connect with our mental, emotional, and spiritual bodies in a good way. Click on the links for more details and for an up to date itinerary on this project as it gets up and running. Every dollar donated will go directly to ensuring the best success for this road trip and the vision. Any amount you can offer is appreciated. This is an act of co-creation, and I’m asking for your help. For those that donate over a certain amount, I will pledge these items in gratitude for your trust, love, and support. Divination - Up to 30 minutes of recorded session to view underlying factors and current themes influencing the recipient’s life choices. A blessed, cleansed and sanitized goose feather that has accompanied Stephanie on the entire spiritual journey to sacred sites. Will be shipped to recipient after trip at no additional cost. Recipient may follow the feather’s journey on Instagram during the trip! Distance Shamanic Healing, with PDF notes, and audio recording of findings. Shamanic Healing with 30 minute telephone consult, PDF notes, and audio recording of findings. Group Healing Ceremony, and hand crafted power object. Facilitated online, or in person if located along route and timelines coincide. Shamanic drum & mallet with commissioned artwork by Stephanie Seger. After road trip is completed, I will provide individualized attention for co-creation of commissioned artwork on recipient’s new or already owned drum. Consultation and completion date to be determined with the recipient. To raise awareness for this Tour, we will be starting to do Drum circle flash mobs! Here’s the first one! We now have these as little advertisement promos! If you might know friends who would be willing to help contribute either monetarily, or know people in the locations we will be visiting, feel free to share! Here's the big blog post where you can read more details about the trip!